BuySoundtrax Records is proud to announce the release of FIREFLIES IN THE GARDEN featuring music composed by Jane Antonia Cornish. The soundtrack will be available digitally on November 1st and on CD from www.buysoundtrax.com on December 1, 2011. Jane Antonia Cornish’s film composing credits include ISLAND OF LOST SOULS, SOLSTICE and the forthcoming HIGHLAND PARK. In addition to receiving a BAFTA award for her score to The Jim Henson Company's 5 CHILDREN AND IT, Cornish received a Danish Academy Award nomination and a Movie Music U.K. award for scoring ISLAND OF LOST SOULS. The International Film Music Critics Association nominated her for Breakthrough Composer 2007 for her score to ISLAND OF LOST SOULS. In addition to her composing work, Cornish has worked in Hollywood as an orchestrator on KUNG FU PANDA, HORTON HEARS A WHO and HANCOCK. Cornish’s symphony received a Special Distinction by the ASCAP Foundation’s Rudolph Nissim Prize Jury, and her piano-trio piece Duende received its commission by renowned Chamber Music ensemble the Lee Trio. Duende premiered at the Chelsea Music Festival in 2010. FIREFLIES IN THE GARDEN tells the story of the Taylor family. To an outsider, the Taylors are the very picture of the successful American family: Charles (Willem Dafoe) is a tenured professor on track to become university president, son Michael (Ryan Reynolds) is a prolific and well-known romance novelist, daughter Ryne (Shannon Lucio) is poised to enter a prestigious law school, and on the day we are introduced to them, matriarch Lisa (Julia Roberts) will graduate from college -- decades after leaving to raise her children. But when a serious accident interrupts the celebration, the far more nuanced reality of this Midwestern family’s history and relationships come to light. FIREFLIES IN THE GARDEN also stars Emily Watson, Carrie-Anne Moss, and Hayden Panettiere. According to Cornish, “The director, Dennis Lee, was looking for a deeply expressive score.” To accomplish this goal, Cornish focused on developing the film’s musical themes, performed by world-class soloists. “It’s a classical score for solo violin, cello, piano, oboe and chamber orchestra,” she explained. She described the main theme, which features solo cello, as ‘lush’ and ‘evocative’. An additional theme for Lisa’s (Julia Roberts) character was written for piano trio to be ‘poignant’. 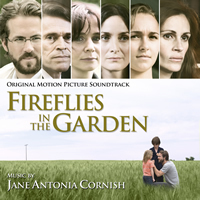 BUYSOUNDTRAX Records presents the original motion picture soundtrack to FIREFLIES IN THE GARDEN, featuring music composed by Jane Antonia Cornish. The first 100 copies sold through our website will be autographed by the composer.